Today was parent-teacher conference day at school, and because I am an assistant I got the day off! I have never been happier not to be teaching. Conferences were my absolute least favorite part of my job as a teacher. I took advantage of this day off to become an official resident of Missouri. It is sad to see my Virginia tags and license replaced, yet the experience was way more pleasant than I expected. In Virginia, you go to the DMV and wait and wait and wait. After waiting, you may receive the help you need, you may not. It is extremely complicated and stressful procedure. Here in Missouri, they have no DMV (gasp). They have little License Bureaus that are located in small store fronts in strip malls. There are many of these offices. Yes, you take a number, yet there are usually only 2-5 people in line ahead of you. I went to get my license and my plates separately today, and each trip took a total of maybe 20 minutes until everything was said and done! 20 minutes! I have to say, that this is one thing that Missouri does better than Virginia. At my new school, I am a kindergarten teacher in the morning, and a reading intervention teacher in the afternoon. During my reading lessons, I use Post-it Correction tape to cover up the kids writing mistakes. 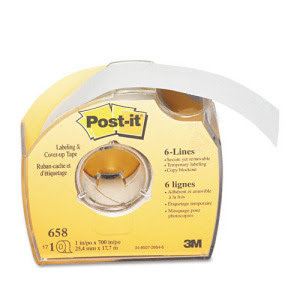 Instead of calling it "Post-it correction tape" to the kids, I call it boo-boo tape, because it covers their writing "boo-boos". I have been meeting with these students for about 4 weeks now, and a student just asked me why I keep calling the tape booby tape. Ha, for 4 weeks he has assumed I have been saying booby tape multiple times throughout our lesson! Beautiful stables for the Clydesdales. 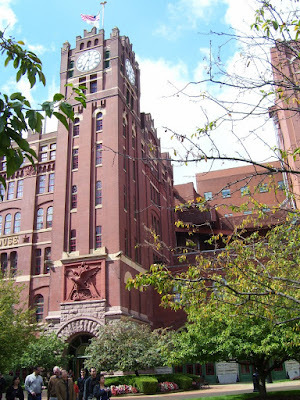 This used to be an old schoolhouse for the Anheuser and Busch children. Once they figured out that running a school on the property of a large factory wasn't smart, they turned the building into an office building. 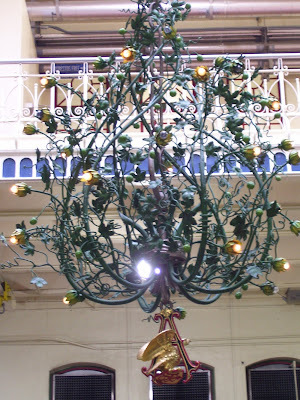 The inside of the buildings were all in use, yet they were beautifully crafted with intricate iron work and huge chandeliers for lighting. It was a fun visit that lasted about 2 hours complete with a beer tasting at the end. 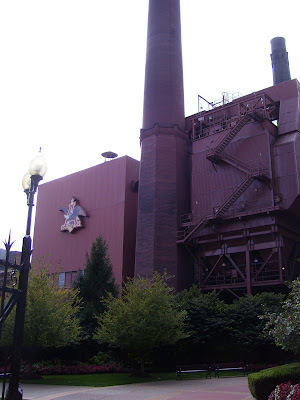 We decided it was a great St. Louis attraction that we will do with most of our guests that come and visit. Best of all it was free! Happy Monday! Marty's parents drove the 15 hours to come a visit for a long weekend this past weekend. We has a wonderful time catching up and sight seeing together. We went to a Cardinal's game on Friday night, and the Cardinals beat the Colorado Rockies! This was my first Cardinals game, and it was such a fun evening I hope we will be able to attend more next season. A few Covenant students told us about a concession stand right outside of the stadium. They sell all your normal baseball food items, yet for really cheap (compared to the stadium food). Hot dogs and brats are $2.oo, as apposed to the $8 ones across the street in the stadium. They have an agreement with the stadium so you can bring all their food into the stadium with you. You are also allowed to bring in a cooler of drinks in plastic bottles. So we enjoyed diet coke and waters throughout the game. There was also a Build A Bear workshop in the stadium where you could make FredBird stuffed animals or bears with Cardinals uniforms. I haven't been to a major league baseball game in a while, so this may be standard at all stadiums, yet I was surprised to see that! Overall, it was a great, Fall evening to sit outside and enjoy a good ball game! For a while now I have been searching the public library's catalog waiting for the book Saving Cee Cee Honeycutt to be available. Last weekend, one copy was available, yet it was a large print copy. I saw nothing wrong with checking out the large print copy, besides I am practically blind at night without my contacts in anyway! Well, Marty was appalled that I would "steal" that book away from the elderly that were probably waiting to read that one copy in the large print section. This brings up my question...What is library etiquette regarding large print copies? Do you leave them to the elderly? Is it polite to pass by the one copy of the book you have been searching for because it is large print and your eyes can read regular print? Hmm. Still thinking about this one! 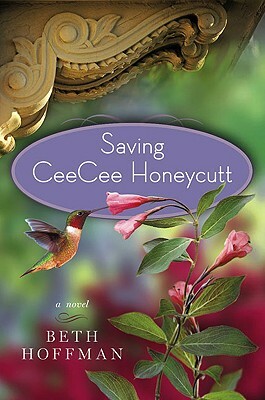 Well, I finished Saving Cee Cee Honeycutt in a week, and as a working girl this is a big task. I couldn't put this book down. I could smell the magnolia blossoms and taste the sweet tea as the author painted such a vivid picture of Savannah. If you can find it in your local public library, it is a quick read that is worth the time.